40 Days to Better Living: Diabetes is a book created by the Church Health Center in Memphis, the largest faith-based clinic of its type in the U.S. Readers are provided with a simple and practical program to help with the management of diabetes through adopting life-changing attitudes and actions. You may choose to focus on just one or two of the seven elements on some days. Other days you may wish to try them all. A 40-day plan is provided that includes real-life stories from other people who have experienced success on the program. Every morning and evening you can reflect on personal biblical teachings as they relate to living a healthy lifestyle. The program provides advice and tips to help you to eat a healthy diet. Brown rice, barley, whole-wheat bread, whole-wheat pasta, low-fat cheese, eggs, fish, beans, nuts, soy, avocado, potatoes, spinach, carrots, cucumber, watercress, cabbage, broccoli, mushrooms, red pepper, herbs and spices, olive oil. Each day you are offered a suggestion for physical activity. For example, you might go for a walk, do some stretching, clean the house or try some jumping jacks. You should gradually increase your exercise level as your fitness increases. 40 Days to Better Living: Diabetes retails at $7.99. Click here to purchase this book online. Encourages a gradual approach when making diet and lifestyle changes. Includes inspirational stories from others who have had success with the program. Will appeal to those of the Christian faith. Emphasizes the value of social support for health recovery. Provides suggestions for stress management and emotional wellness. May not be of interest to those who are not religious. Some diabetics will require more specific guidance to effectively manage their condition. 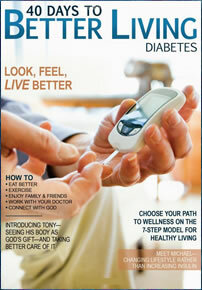 40 Days to Better Living: Diabetes is a faith-based program designed to help diabetics to adopt a healthy lifestyle. It includes inspirational stories and a large collection of tips and advice related to all aspects of healthy living. By following the 40-day plan you can make gradual changes that will result in a significant improvements in your health.